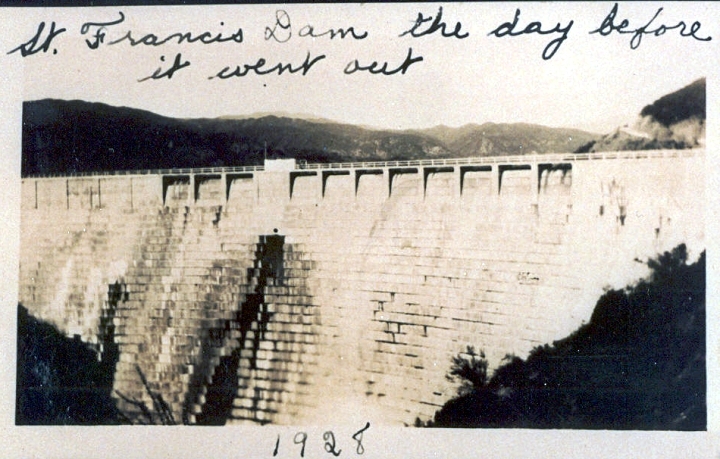 "My parents were at the dam on Sunday, March 11, 1928. They were on one of their many 'Sunday drives' that they took with my father's parents. They had been married less than a month and March 13, 1928, was my mother's 19th birthday. My grandfather noticed something strange about the dam and pointed it out to my father. The story I was told when I was young (I was born in 1946) is that my grandfather saw muddy water coming from the outlet in the dam and told my dad that they needed to get out of there right away. From the material I've read about the dam and its failure, this must have been debris stirred up by the submerged landslide that eventually lead to the dam's failure. When they were down the road from the dam my dad stopped the car and my mother took a picture of the dam."